When I first made this chicken recipe my family loved it so much they preferred it for Thanksgiving instead of a turkey. It comes out beautiful looking and it's very moist with a nice hint of garlic and herbs. Remove giblets, rinse chicken, and pat dry. Cut one clove of garlic in half and rub the garlic over and under the chicken skin. Place all the garlic cloves inside the chicken cavity. Pour both chicken broth and balsamic vinegar over the chicken breast, then sprinkle the herbs on top of chicken. Turn the chicken over and place the chicken breast side down on a rack in a shallow roasting pan. Turn chicken over, baste, put meat thermometer in chicken thigh, and continue roasting for an additional 35-40 min. or until meat thermometer inserted in thigh reaches 180 degrees. 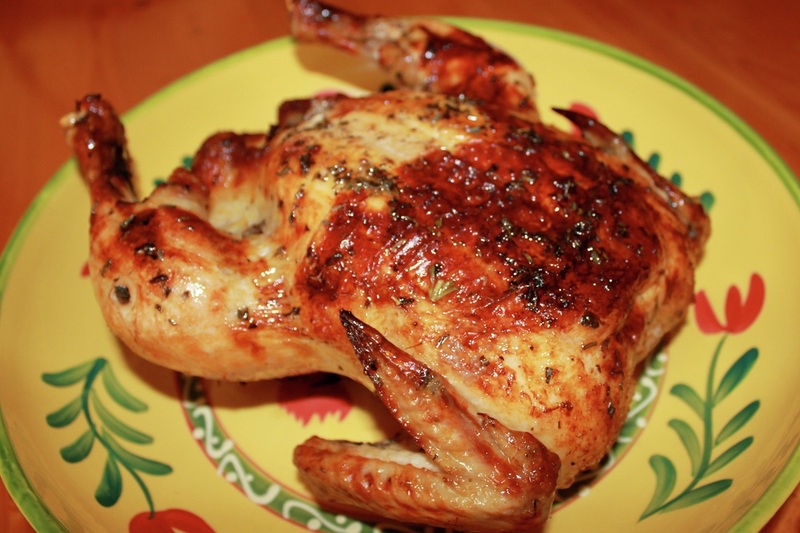 Take chicken out of oven when finished roasting. Take rack out of roasting pan and place chicken in pan juices, breast side down. Cover with foil. Let sit for 15-20 min. before carving.